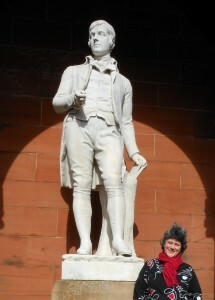 More to add to my on-going Editor’s blog on the Burns songs for George Thomson! This past couple of weeks have been busy and productive. Lots of new reading on Burns’s songs and some work also on Byron’s involvement in Thomson’s collections, which has allowed me to revisit some work I did a while back for a conference which I wasn’t able to attend because of snow! Byron’s connection with Thomson’s work is at the opposite end of the spectrum to Burns – he was at arm’s length and most of the interaction was through his publisher John Murray. Byron didn’t regard himself as remotely in the same league as Burns or his mate Thomas Moore when it came to writing songs – or so he wrote in one of his few letters to Thomson! I feel as if I’m well in the depths of the Romantic imagination at the moment. 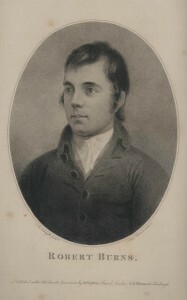 Specific work on Burns is still relating to his correspondence with Thomson and Gerry McKeever has just returned from a few days in the British Library to view, in person, the Burns family letters in Thomson’s letterbooks there. We are pulling together more of a picture of how Thomson interacted with the family, notably Robert’s brother Gilbert and widow Jean Armour, in the early decades of the nineteenth century – trying to get to grips with how Thomson saw his role as custodian of Burns’s songs at this point. Gerry will say more about this in due course, but we’re also finding out just what kind of a role Thomson played in the early memorialisation of the poet. Needless to say there are controversies here, especially concerning payment to Burns and we are trying to untangle all of this and map out the real facts. Already it’s clear that dealing with even immediate posthumous reception of Burns is very complex! One highlight for me last week was spending the day in Ayrshire visiting the Burns Monument Centre in Kilmarnock – see: http://eastayrshireleisure.com/. I wanted to scour through their holdings of Thomson volumes and also spend a while looking at some of the miscellaneous Burns books they have on the open shelf, which I’d noticed last time I was there and some of which I wasn’t aware of. I had the pleasure of chatting further with Professor Patrick Scott, over that week from the University of South Carolina, who was also working on Burns – he took this picture and I took a similar one of him!